Almazbek Atambayev said that Kazakhstan "is imposing its candidate." Under the latter, he had in mind the ex-prime minister Omurbek Babanov, whose ranking, according to various opinion polls, is significantly higher than that of Sooronbai Jeenbekov - pro-government candidate. Atambayev accused his Kazakh counterpart that after meeting with the presidential candidate Babanov, Nazarbayev interferes in the internal affairs of Kyrgyzstan. Kyrgyz President Atambayev even refused to attend a meeting of the Council of Heads of State of the Commonwealth of the Independent States and the Higher Eurasian Economic Council, which passed in Sochi on 10-11 October. Instead of himself, he decided to send his "right-hand man," Prime Minister Sapar Isakov. The Office of the President circulated a message saying: "Given the revealed facts of preparation of mass riots on election day by some politicians with the involvement of criminals, as well as financial support for such politicians from abroad, the president decided to cancel his working visit in order to personally control the order and security in the country." Atambayev's nervous attacks are quite understandable. 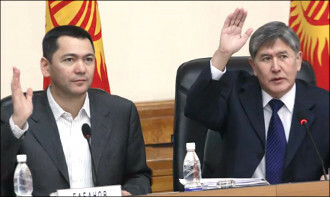 The influence of the opposition candidate is growing because the electorate believes Babanov is a lesser evil than Jeenbekov, who promises to continue the failed policy of the incumbent president. Even the administrative resource and the involvement of crime do little to help convince the population. The situation has escalated to such an extent that the authorities may try to remove Omurbek Babanov from the election race. In turn, it would cause people's displeasure. On 10 October, the Central Election Commission issued a third warning after complaints of violations allegedly committed by presidential candidate Babanov. Fergana turned to the experts with the question of whether there should be any social protests and why President Atambayev abstained from going to a meeting with his colleagues in Sochi, Russia. Russian political scientist Arkady Dubnov recalled an example from his school youth. "When we went to school, and if we messed, the next day it was scary to come because they could scold us or call our parents. Atambayev behaves like a schoolboy and fears of being alone with Nursultan Nazarbayev. After all, he insulted not only him personally, but the whole country. Atambayev cannot even imagine how he will sit at the same table with other heads of the CSTO (Collective Security Treaty Organisation) and the Eurasian Economic Union. As for the possibility of riots, if they happen, then Almazbek Atambayev personally will be to blame for them. They will become possible because of his provocative statements and actions. If his rhetoric keeps on the verge of only insults, the elections will still pass without problems. But if he finds an excuse to remove Babanov, then riots are possible. A well-known political observer in Kyrgyzstan Naryn Ayip believes that the threat of destabilisation of the situation is not too real. "Atambayev remains in the country to monitor the preparation and conduct of the elections," the journalist said. "It is possible that without it power structures can limit themselves to the performance of their direct duties, without exceeding the constitutional powers. Similarly, in the fall of 2015, the Kyrgyz president cancelled his already scheduled visit to New York to the UN General Assembly before the parliamentary elections in Kyrgyzstan. Then he travelled to the regions, openly campaigning for the Social Democratic Party (SDPK) and got the desired result. It turns out that he does not really believe that his subordinates will do everything in their power to his interests without his direct control. And indeed it is. Political scientist Aleksander Knyazev believes that the information of Atambayev's office implies readiness for provocations aimed either at removing the main opponent of the power Omurbek Babanov from the campaign, or for abolishing elections in principle and appointing new election. "It will mean a fundamentally new list of candidates, in which Prime Minister Sapar Isakov is likely to be the reserve candidate from Atambayev. The reserve was Deputy Prime Minister Temir Djumakadirov and in this context his death is extraordinary. The cancellation of Atambayev's trip to Sochi has several meanings. It is another look at Isakov taking into account changing circumstances. It is the impossibility of conflict-free participation of Atambayev himself in the summits and his meetings, in particular, with Nazarbayev. And probably his fear of leaving Kyrgyzstan unattended, although in reality, then there is very little that is happening and that can happen depends on him. Expert Igor Shestakov noted that the cancellation of Atambayev's visit to Sochi might be due to several reasons. "The first is an election, as, as you know, Almazbek Atambayev promised that they will pass honestly, without using administrative resources and in a calm atmosphere. And personally, the head of state acted as the guarantor of the peaceful transfer of power. Now the situation in Kyrgyzstan is quite tense, given the high level of political competition. A tragic death in the car accident of the vice-premier on the power bloc of Temir Djumakadirov, who headed the Republican election headquarters, rendered a certain influence on the incandescence of the situation. In general, it cannot be ruled out that there can be any incidents or provocations on the eve of the election or the day of voting. I remember that on the eve of the presidential elections in 2011 there were also rumours about possible rallies and provocations. But then the pre-election situation was much calmer than now. As for more specific versions of possible riots, these are questions, more likely, to representatives of law enforcement agencies. The second reason the expert called possible interest of Atambayev was that the young head of government had the opportunity to declare himself as a politician at such a representative interstate forum. "As it is known, constitutional amendments come into force on 1 December, which significantly increases the status of the head of the government. The initiator was the president himself. Many foreign policy issues, in the context of economic interaction, will be in the prime minister's area of responsibility. And there will be a meeting of the Supreme Council of the heads of state of the EAEC in Sochi, where Sapar Isakov will have an opportunity to present the prospects for the work of the new Cabinet to the heads of state - the foremost trade and economic partners of Kyrgyzstan. In this regard, the participation of Sapar Isakov looks even more logical. Human rights activist and lawyer Dinara Mukanbayeva is sure that the threat of mass riots is possible only on the part of the authorities. "Perhaps the authorities are preparing another provocation, they are professionals in this regard, especially the Osh events of June 2010, when artificially pushing two ethnicities to distract the attention of the people from the main thing, was remembered by the Provisional Government engaged in redistribution of power, robbed and divided the people money among themselves. The authorities carefully prepared for the upcoming election: they removed the undesirables, closed them in prisons, filled up activists and journalists with multimillion claims, closed independent media, staged harassment and intimidation of activists. I believe that the present government is a threat, which does not want to leave. Human rights activist Zulfiya Marat said that not only mass protests of the opposition in the capital or the regions had not been scheduled for 10-11 October, but even any rallies in the centre of the capital are banned. "The State Committee for National Security reported about starting criminal proceedings on the violent coup attempt against Babanov's supporter, Member of Parliament Kanatbek Isayev. It is a third similar charge for a year and a half against those who dared to have a different opinion than the president. Before that, several former MPs sentenced to long terms of imprisonment. Speaking of the cancellation of the visit of the head of state to Sochi to meet with colleagues, I think we should have been expected it after he offended the leader of neighbouring Kazakhstan. We presented the opinions of only a few of the experts interviewed. And many agree that if any excesses in the country occur, it will be more the current government's fault. Atambayev, though he promises honest elections, is actually playing a double game, promoting his protégé. And it is the actions of the president that can become a catalyst for protests that are capable of escalating into mass riots.